An inspiring gift of tradition. 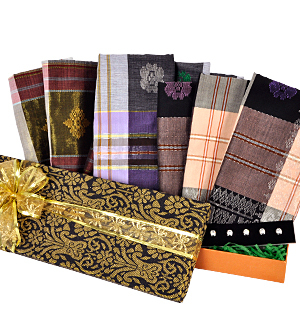 This elegant, hand woven Koleksi Kain Tenun PENUH Bunga Tabur limited edition (from 2.2 meters) comes stylishly presented in a unique handcrafted songket box, and complemented with 5 pcs of Swarovski Butang Baju Melayu. Note: Each piece of Kain Tenun is individually created and unique in design and colour. The Kain Tenun is available in a variety of colors.